B2bbazar.com is indian b2b business trade directory website find here indian exporters marketplace suppliers companies b2b products manufacturers b2b sales market. Providing a complete internet solution to SME's and Corporates for quickly building their brand worldwide, increase awareness and generate business leads at an affordable price. b2bbazar.com's solution includes right from creating an online presence, to promoting in search engines, promoting in b2bbazar.com own business portals, promoting in social medias & providing payment gateways / ecommerce platform. 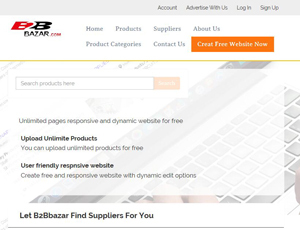 About B2bbazar.com - B2b marketplace portal's recommend,only on behalf of the views and opinions about B2B Directory, if you have any suggestions , please feel free to contact with us, we will amend and correct them in the first time according your suggestions. More better B2B Websites recomend, Please click here.